Vol. 16 – Day 116 P.E. March 7, 2017 The TrumpShaker Comments Off on Vol. 16 – Day 116 P.E. The week began with the media fawning over Trump’s speech to Congress. It ended with calls for the Attorney General to resign, Trump accusing Obama of breaking the law, and a fruitless search in the bowels of Congress for the Republican alternative to the Affordable Care Act. All the sordid details are in this week’s edition of The TrumpShaker. Attorney General Jeff Sessions became the fifth member of Trump’s cabinet to have made false statements to Congress. I hope Trump remembered his punch card because I think with his fifth, he gets a free frozen yogurt. When pressed by Senator Al Franken (D-MN) on whether Trump campaign officials met with Russians, Sessions totally forgot that he had actually met with the Russian ambassador twice – once in July and once in September. The very same Russian ambassador whom Mike Flynn lied about meeting with and then couldn’t remember what they talked about. Either there’s some reason to hide meetings with him or this ambassador has a real zero charisma problem and needs to make a stronger impression. While denying any wrongdoing, Sessions recused himself from investigations into Trump’s campaign relationships with Russia. This satisfied few as an irate Trump summoned Sessions to his lair at Mar-a-Lago for a lashing and leading Democrats called for Sessions to resign. Last summer, at the GOP convention, language in the party platform was surprisingly changed to significantly soften for Ukraine in its battle with Russia. At the time, the Trump campaign denied any involvement in this change. However, now with the sharks circling, former Trump national security advisor J.D. Gordon told CNN on Thursday that he pushed for the platform change at the request of Trump himself. In an unhinged tweetstorm on Saturday morning, Trump accused President Obama of ordering a tap on his phones during the campaign. A President ordering a tap on his political rival without a court approval would be illegal and would be a bigger scandal than Watergate, so a kind of serious allegation. Trump, who literally has access to almost every piece of information in existence in the United States, did not provide any evidence and according to Trump tea readers, he got the story from an unsubstantiated Breitbart article (not sure there is another kind of Breitbart article) that morning. There have been two reports, one by the BBC and the other by The Guardian, that US intelligence agencies had sought a warrant from the Foreign Intelligence Surveillance Act (FISA) court to monitor Trump team members who had been in contact with the Russians. No other news agencies have confirmed these reports though. Also, this morning on Meet The Press, the former Director of National Intelligence James Clapper explicitly denied there was a FISA court warrant to monitor the Trump campaign. Trump is not backing down, with the White House now calling on Congress to investigate this baseless accusation. The two takeaways are that Trump is really not stable and that we’ve collectively lost our ability to be shocked when the current President accusing the former President of spying on him is met with a collective shrug of the shoulders. For a deeper dive, here’s a good read. Trump delivered a speech to Congress on Fat Tuesday. He managed to read the entire speech without talking about the size of his inauguration, calling Senate Minority Leader Chuck Schumer (D-NY) a clown or throwing his own feces, so media pundits declared he was now finally “presidential”. Apparently, all it takes to be President is to impress a panel of Paula Abduls that your performance makes you the next American Idol. It’s truly troubling how eager many in the media are to forget all he has said and done so things can be normal again.We can see who Trump really is by listening to what he said earlier in the day on Tuesday; when he wasn’t reading what someone else had written for him. Trump said he believes former President Obama was behind protests at town halls across the country as well as the leaks springing from all over his administration. Trump insinuated that the rise in anti-Semitic acts since his inauguration, including over 100 bomb threats at Jewish Community Centers across the country, may actually be not from anti-Semites but “the reverse”, i.e., people who are doing it to make him look bad. In Houston, ICE deported a father of two, with no criminal record who is married to an American citizen. The reason? His mother had filed incorrect paperwork more than a decade earlier, when he was teenager. So this week he was sent to El Salvador, a country he has not been to in 16 years. In Mississippi, ICE followed and detained Daniela Vargas after she spoke out against deportation at a news conference. Daniela is 22 years old and came to the U.S. with her family when she was 7 years old. 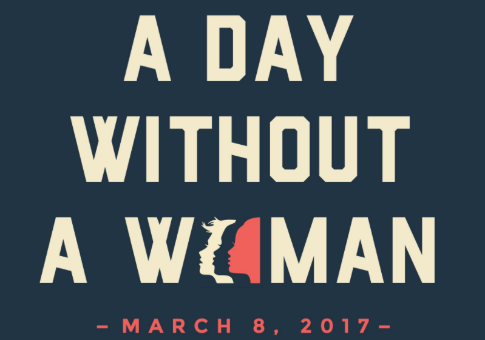 She has twice received Deferred Action for Childhood Arrivals (DACA). However, she could not afford the filing fee for DACA in October when it was due and only recently filed her application in February. She has no criminal record and ICE is now considering deporting her without a hearing. Her statement is at the end of this article. In Oregon, a father of 5 was stopped and held by ICE on his way to work at a nursery because of a deportation order he received in absentia in 1994. In Los Angeles, ICE arrested Romulo Avelica-Gonzalez after he dropped off his 12 year-old daughter off at school and while he was on his way to drop off his 13 year-old daughter. In other dystopian news . . .
Trump featured his new Victims of Immigration Crime Engagement (yep, he made it a cute acronym, VOICE) in his speech to Congress. During the speech, he also pointed out his guests that evening: three people from families of victims who had been murdered by immigrants. Department of Homeland Security will now publish weekly crimes committed by immigrants. You know, just like the Nazis used to do. This serves no other purpose but to whip up anti-immigrant hysteria. Although Trump is likely still mad at Meryl Streep for speaking out against him at the Golden Globes, he has decided that he really liked the premise of one of her movies, Sophie’s Choice. The Department of Homeland Security is considering a new policy to force families caught entering the U.S illegally to choose to either return to their country or be separated while awaiting a hearing, i.e., the parent(s) would remain in a detention center and the children would be placed elsewhere in state custody. All of the above occurred after an anonymous “senior administration official” said that Trump was considering a kinder gentler immigration policy. The punchline is . . . that anonymous senior administration official was later outed as Trump himself. Since he once had to play an adult with the maturity of a 12 year-old boy, Tom Hanks is one of the few people that understands what Donald Trump is like. 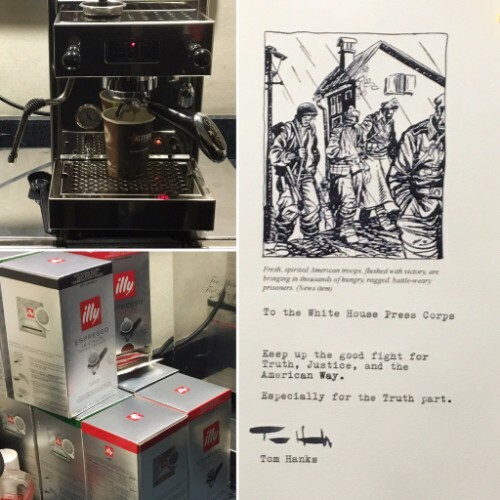 Hanks gifted an espresso machine this week to the White House Press Corps to keep them energized for their fight with the giant child. Hide and Go Seek Healthcare – Confusing Purim with Passover, Paul Ryan hid the GOP replacement plan for the Affordable Care Act like the afikomen under lock and key in a secret room in the basement of Congress. 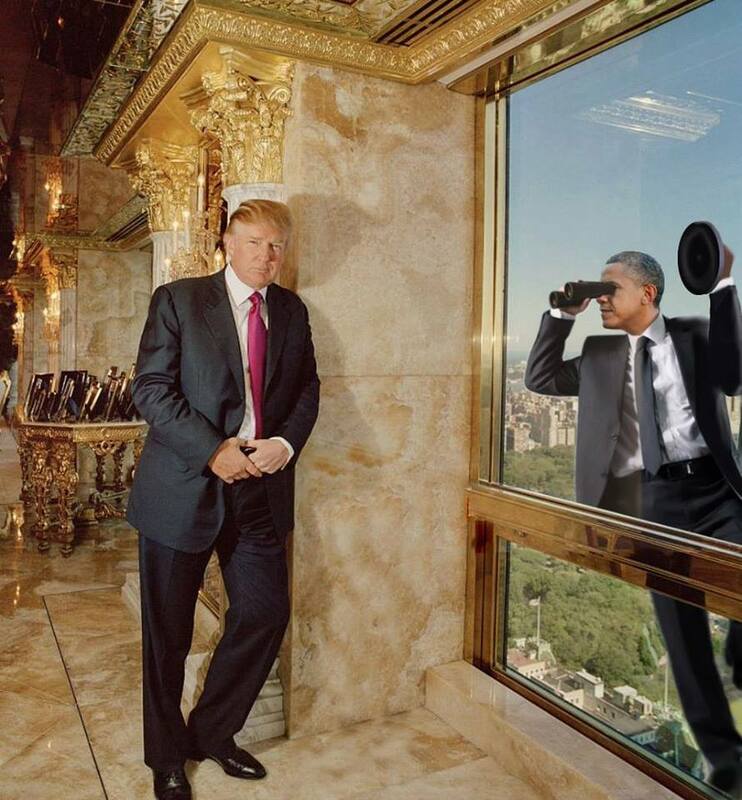 He wouldn’t even let fellow Republicans see it. Senator Rand Paul (R-KY) went on a hunt to find it with a copier machine and camera crew in tow (it was like a really boring version of National Treasure). Rand Paul was denied entry to the room and to the document. Making Great Pollution for the Great Lakes – The results in the Great Lakes region were the shock of the election. Wisconsin, Michigan, Ohio, and Pennsylvania, still reeling from immigrants from Mexico and the burden of Obama saving the auto industry, all went for Trump. As a thank you to these states for their support, Trump’s initial budget proposes cutting EPA funds to clean and restore the Great Lakes by 97% from $300 million to $10 million. Making America Smoggy Again – Next week, Trump is expected to relax restrictions on tailpipe emissions of carbon dioxide. Also, EPA Head Scott Pruitt, who as Oklahoma Attorney General fought relentlessly against the EPA under the states’ rights banner, is expected to direct the EPA to begin proceedings to revoke California’s waiver that currently allows the state to enforce more stringent tailpipe emissions standards than under federal law. And Another One’s Gone And Another One’s Gone – In the last two editions, I’ve mentioned the “peace plan” for Ukraine brought together secretly by some sketchy Trump associates. I’ve also mentioned that Russians and Ukranians seem to be disappearing like rivals of Walter White. So, the meeting that brought the sketchy team together was apparently organized by Ukranian businessman Alex Oronov. Well, guess who unexpectedly died this week? Nothing to See Here, Move Along – Despite not reading the Department of Justice reports on police abuse in Ferguson and Chicago, Attorney General Jeff Sessions declared that under his leadership the Department of Justice will stop monitoring problematic police departments because there are no such things are problematic police departments for Jeff Sessions. Move Along, Nothing to See Here Either – Republicans continued their moral gymnastics by voting against a resolution to force a vote in the House of Representatives to request Trump’s tax returns. The effort failed along party lines 229-185 with two brave Republicans voting “present”, like the sarcastic kids when the substitute teacher takes roll. Lock Him Up! Lock Him Up! – It was revealed this week that when Vice President Mike Pence was Governor of Indiana, he was using his AOL(!) account for government business and it was hacked. I’ll let Mike comment on what he would do about someone using personal email for government business. Support Arkansas Teachers! – The Arkansas legislature is contemplating a bill that would prohibit “any books or material authored by or concerning Howard Zinn.” In reponse, the Zinn Education Project is offering free books from Howard Zinn to Arkansas teachers. Spread the word! Find and Stop Hitler – The company behind Cards Against Humanity developed a new game, Secret Hitler, in which “liberals must work together to discover the truth before the fascists install their cold-blooded leader and win the game.” The company recently made headlines by sending a free version to every U.S. Senator. Previous Post:Vol. 15 – Day 109 P.E. Next Post:Vol. 17 – Day 123 P.E.